On a thirty-six-by-forty-eight-inch canvas titled “Word is Bond,” four boys stood with arms around each other’s shoulders along with a mouse, glaring at the audience. The upper half had a black background, and the bottom half of their bodies went unseen as they disappeared into a pool of white, which it turned out to be a wormhole. Howard wants people to look at things from a different perspective. The idea behind the work is the frustration of communication. In other paintings, characters stood fierce with eye patches and heads of burning fire, insomniac scenes with identical girls shooting blue and golden forces at one another, distorted faces, “shadow creatures,” and concrete guardians. 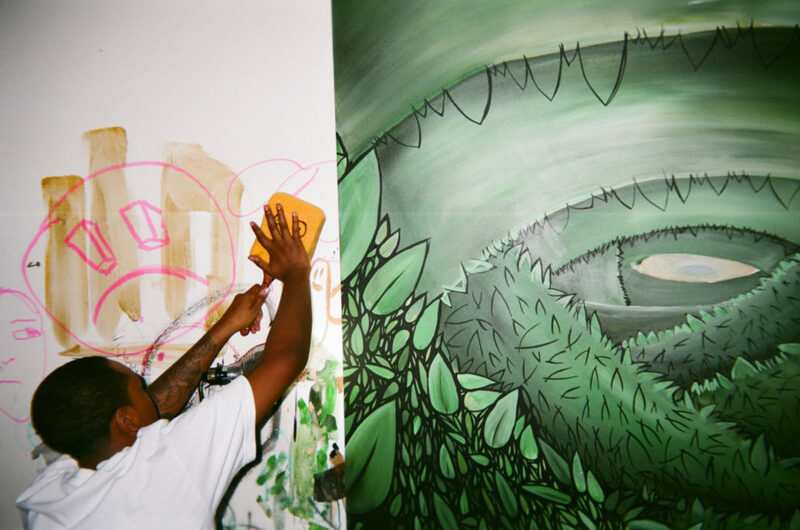 In the August after his freshman show, Howard gave a group of students in After School Matters, a non-profit organization for Chicago high school teens that he attended himself, an artist talk in the gallery space. Some asked questions while others stared into the work, pointing to details they liked. It was not until Howard gave them what he called the “real talk” that the students really became focused, as if something clicked and heard something they had been waiting for. Each show is a countdown, starting from Chapter 5, of the chapters in his book. “As each show progresses, you’re getting…an introduction to the world,” he said. Shortly after his first solo show and his talk with the students at ASM, Howard was already back to working on the pieces that would later be included in “Chapter 4” in February. 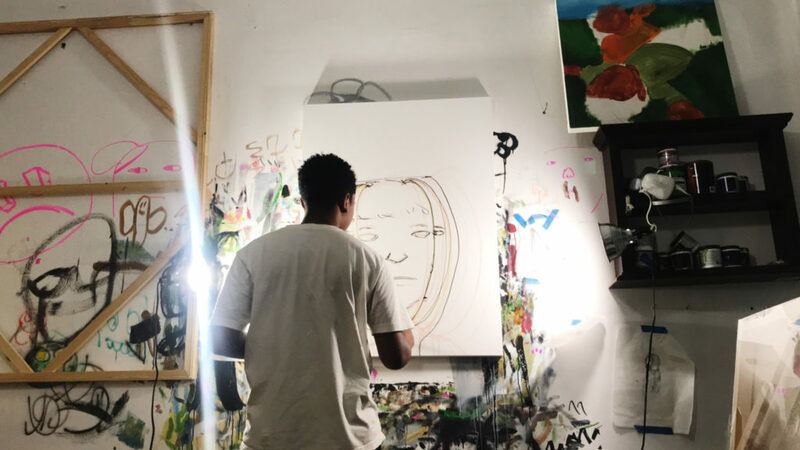 In the studio space that he shares with Nikko Washington in the Fine Arts Building, Howard was in the middle of making a big skull on a forty-by-forty-inch canvas. Titled “Broken Hearts Club,” it went into February’s exhibit, which would be centered on breaking down situations and presenting them as ideas, rather than in their actuality. “Broken Hearts Club” takes from Howard’s personal experience of getting advice from older generations to find a partner and settle. The painting was not an actual scene of people together and getting tired and old, but rather the idea of it. At one point, Howard’s mother Lena joined our interview. He went from wall to wall, picking up the paintings that hung on display and explaining them to his mother, a major support system for all of his work. He explained that part of the reason he wants to discuss communication in his illustrations and narratives is because she always stated it is a key point in life. Holding “Comeback Kid” on a sixty-by-thirty-six-inch canvas, the painting moved with his energy, as it illustrated a one-eyed boy with a patch and another kid with fire for a head, both on a deep red background. “This piece is about becoming friends with your demons and realizing you shouldn’t be afraid of them,” Howard explained. Next Howard reached for “Budding,” identical characters on a thirty-by-forty-inch canvas. The piece contains a 24-karat gold leaf stamped in the center, giving the illusion that indeed it is burning a light through the canvas. Blue and black clouds transgress above a forest that lurks behind a girl with an esoteric face beginning to decompose. A similar girl stands next to her with an exposed skeleton. As he waved this painting to show us, circulating the living room space, it was almost like we existed in the same realm as the characters in the paintings, as if they were portals from which they entered and demanded recognition. Howard’s “Chapter 4: Shapes us all” arrived on a cold winter night this past February, hosted in the intimate space of Vault Gallery located in East Pilsen. Wooden carve-outs of floating children and falling birds were scattered around the room, and rocks jutted from the canvasses. Everywhere, eyes were watching. Howard’s next show solo, Chapter 3 of the latest installment from Into the Wild, exhibits this Friday, April 5th, at AdventureLand Gallery, 1513 N. Western Ave., from 6pm–10pm. Natasha Estevez is a Multidisciplinary Storyteller who dedicates Multiple odes to everything that has pulled her out the Muck. This is her first piece for the Weekly. Natasha, I really enjoyed meeting you and Armani at the opening on Western a few weeks ago. Good work!